A 52-year-old man visited his family doctor 2 days after he noticed fever and was diagnosed with influenza A using an influenza rapid diagnosis kit; he underwent treatment on an outpatient basis. He was immediately hospitalized after developing fever, abdominal pain, malaise, and shock 16 hours after the commencement of the treatment. 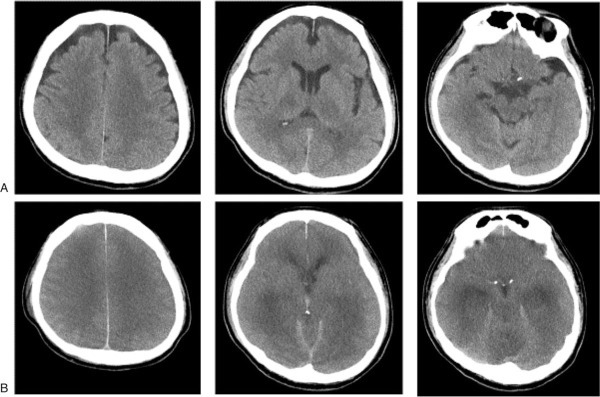 Abrupt acute brain swelling was noted 24 hours after hospitalization. For the treatment of influenza A, laninamivir 150 mg was started immediately after the diagnosis by the family doctor, and 600 mg dose was given daily after hospitalization (or since 24 hours after the treatment initiation). For the management of shock, dobutamine 3 μg/kg/min and noradrenaline up to 0.2 μg/kg/min were used together with bolus infusion. The patient was declared brain dead on his 6th hospital day and he died on his 27th hospital day.